Bolo Bhi and Digital Rights Foundation fear the blocking of internet and mobile networks in the run up to and during the General Elections 2018 in Pakistan, and call on the caretaker government of Pakistan to ensure mobile and digital accessibility, protection of freedom of speech, and the right to association as citizens exercise their democratic and civic duties on July 25, 2018. We, as the citizens of Pakistan, are not new to the idea of total and partial network shutdowns that affect the way people communicate in current technologically advanced times, and unreasonable attempts like internet shutdowns to conceal security lapses go against the constitution of Pakistan. Internet shutdowns have not proven to contribute substantial benefits towards national security and/or against terrorism. In fact, they promote chaos among people at the receiving end of this violation of their fundamental right to free speech as guaranteed under Article 19, and the right to information under Article 19-A, and have been declared illegal by the Islamabad High Court earlier this year. Internet has become a primary source of information for the people of Pakistan, and often times we see mainstream media adopting news from online platforms. The ambulatory nature of the mobile-based internet allows for everyone to contribute news for the people, and makes way for misinformation to be rejected through evidence-based reporting. This misinformation has long been furthering chaos and unrest among unaware citizens, one example of which was seen during the social media blackout amid nationwide violent protests from extremist organisations on November 22, 2017 that held Islamabad hostage for days. 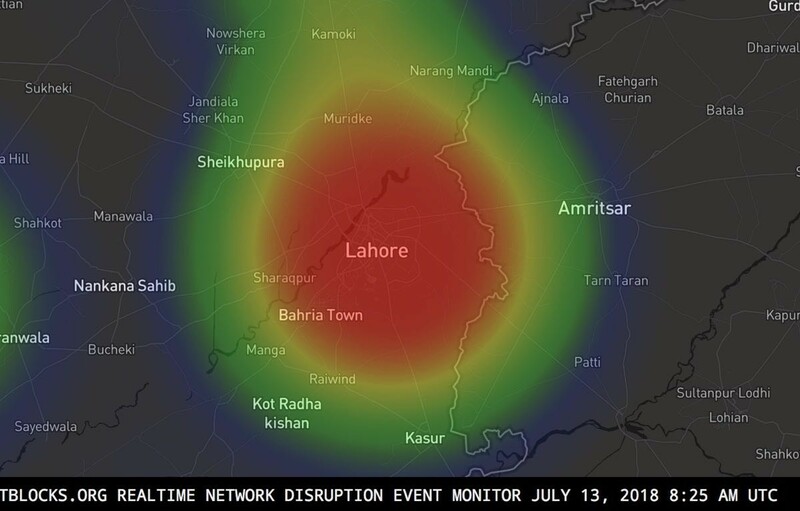 A graph of the recent mobile networks shutdown in Lahore on July 13, 2018, developed by NetBlocks by measuring the intent of disruption in the city, depicts internet and telecommunications suspension at a time of crisis when access to information was most vital. Working together, the signatories will continue to observe internet connectivity across Pakistan throughout the election period. Pakistan is a new democracy that is constantly struggling to hold the title despite the influence of other forces and actors. The second transition of democratically elected government despite threats of collapsing democracy is testament to the country’s disposition to the idea of a government for the people, by the people, and of the people. Whereas draconian laws like the Prevention of Electronic Crimes Act (PECA) 2016 have already limited people’s right to free expression in online spaces and other distressing attacks on advocates of the said right, it is important that the internet and online spaces remain open and accessible without disproportionate barriers in the name of security. Law enforcement agencies have never provided sufficient evidence that can establish a link between shutting down communications and increased safety at a gathering or event. Rather, network shutdowns cause further panic as people are unable to communicate and update others in case of a mishap. We demand that protecting the fundamental rights to speech, assembly, and association as promised under the Constitution of Pakistan be held above anything, and suggest that the caretaker government take reasonable on-ground security measures to ensure safety of citizens accordingly instead of cutting off citizens from each other. Digital Rights Foundation (DRF) is a non-profit research-based advocacy organisation focusing on ICTs to support human rights, democratic process, and digital governance. Visit www.digitalrightsfoundation.pk for details. Bolo Bhi is a not-for-profit geared towards advocacy, policy and research in the areas of gender rights, government transparency, internet access, digital security and privacy. Visit www.bolobhi.org for details. The NetBlocks Group is a civil society group working at the intersection of digital rights, cyber-security and internet governance. Independent and non-partisan, NetBlocks strives for an open and inclusive digital future for all. Visit netblocks.org for details.